This baked ziti hits home. It’s a delicious casserole full of cheese and pasta, and if you ask me, that’s one awesome dinner dish. It fills you right up and always satisfies even the pickiest eaters. You really can’t go wrong with the comfort classic! 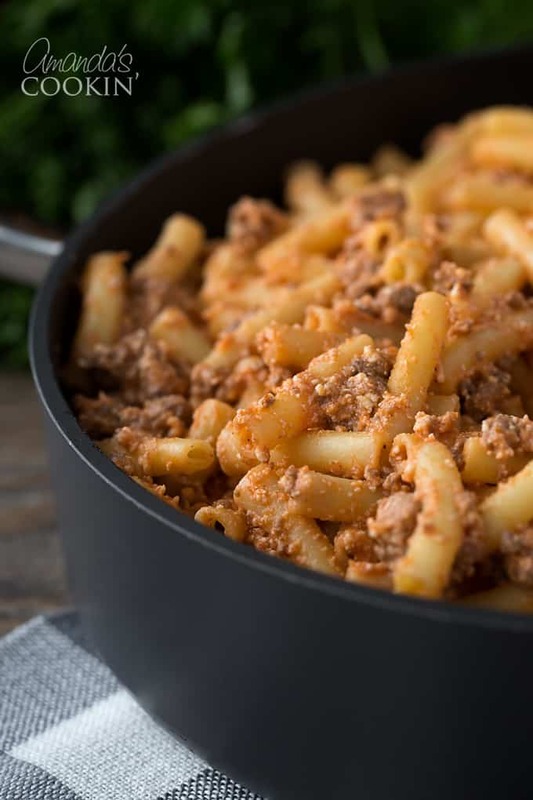 My kids have always been huge pasta fans, and baked ziti is definitely their favorite meal for dinner. When they all lived at home they asked for this dish what seemed like every other night. Luckily, it’s pretty simple to make. 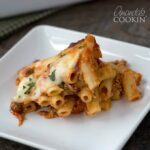 That’s why it’s been a favorite recipe of mine for a long time, even though I’m not a huge casserole person this baked ziti always hits the spot. After you put the ingredients together and get it in the oven, sit back and enjoy the aroma of fresh baked ziti cooking in the oven. What’s even better? 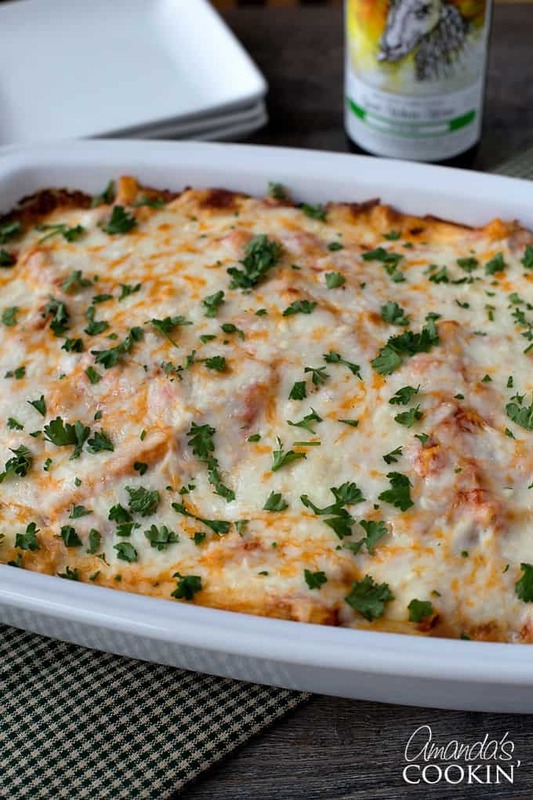 You can make this baked ziti ahead and keep it in the fridge or freezer to enjoy later. Just like this Pizza Sandwich Casserole, this is a perfect casserole to bring along to a potluck or to a school banquet as a dish to pass. I used my own homemade spaghetti sauce for this recipe, you can find that below. Otherwise, canned sauce will do the trick as well. Heat oil, onion and garlic in large saucepan, cook until tender. Add water, tomato sauce and tomato paste to garlic and onion. Mix well. Add basil, garlic salt and pepper to taste. Bring to a boil. Reduce heat and simmer. Makes enough sauce for two family size servings (family size = 4 adults or 2 adults and 4 children with leftovers). Preheat oven to 350 F. Cooked ziti pasta per package directions, drain. Brown the ground beef until no longer pink, drain. Stir in the ricotta, parsley, egg, salt, pepper and 2 cups of the spaghetti sauce. Add cooked ziti and toss to coat. Put ziti mixture into a 13×9 baking pan and cover with the remaining 2 cups of spaghetti sauce. Sprinkle with mozzarella cheese. Bake for 30 minutes or until cheese begins to brown. I hope you enjoy this classic casserole dinner as much as my family and I did. What’s your signature casserole dish? This post was originally published on this blog on May 2, 2010. Preheat oven to 350 F. Cooked ziti pasta per package directions, drain. Brown the ground beef until no longer pink, drain. Stir in the ricotta, parsley, egg, salt, pepper and 2 cups of the spaghetti sauce. Add cooked ziti and toss to coat. Put ziti mixture into a 13x9 baking pan and cover with the remaining 2 cups of spaghetti sauce. Sprinkle with mozzarella cheese. Bake for 30 minutes or until cheese begins to brown. Heat oil, onion and garlic in large saucepan, cook until tender. Add water, tomato sauce and tomato paste to garlic and onion. Mix well. Add basil, garlic salt and pepper to taste. Bring to a boil. Reduce heat and simmer- 20 minutes or so. Can you use already pasta sauce and no onion in the ziti leave out beef,egg in the pasta? Jarred pasta sauce is fine, no onion is fine. You don’t have to use the beef. The egg helps hold the ricotta cheese together. I’m a dingbat . . . how much ziti do you use? I can’t seem to find it on the recipe? You are not a ding bat! Somehow that important item was omitted from the recipe when we redid the photos. Thanks so much for pointing that out! It’s a one pound box of ziti. I’ve corrected the recipe and printable version. Thanks! Do you heat it all together when you combine the ritcatta,egg etc. and ground meat? besides spaghetti, my next favorite food is ziti. i have never made it but bought the stuff at the store to bake and serve. however after reading your recipe, i have DECIDED TO MAKE YOURS TOMORROW FOR EVENING MEAL. IT SOUNDS SO SCRUMPTIOUS. thanks for your recipe. This looks delicious! I am going to make it with my Morningstar crumbles instead of beef! Thank you! Sounds like a great, healthy substitution! I'm so glad you liked it Gila, and your changes sound great! Oh right you are, so sorry about that! I edited the instructions, but you simply sprinkle the parmesan along with the mozzarella. 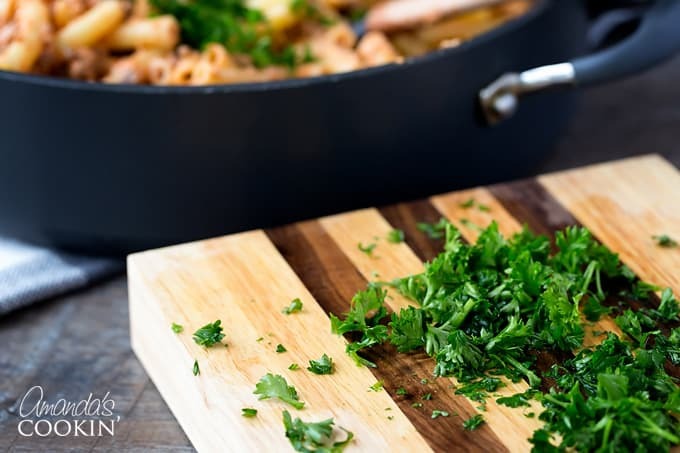 Hi Anonymous – Everyone has different tastes :) That's what nice about a recipe, you can adapt it to fit your own and your family's preference. We prefer it as written. way too much ricotta and way too much meat. I'd use 1/4 lb of beef and 7 oz ricotta instead and add 2 to 3 more cups of sauce. Otherwise this becomes a meat dominated pasta with no sauce taste. I LOVE baked ziti. Yum! Casseroles are the best! 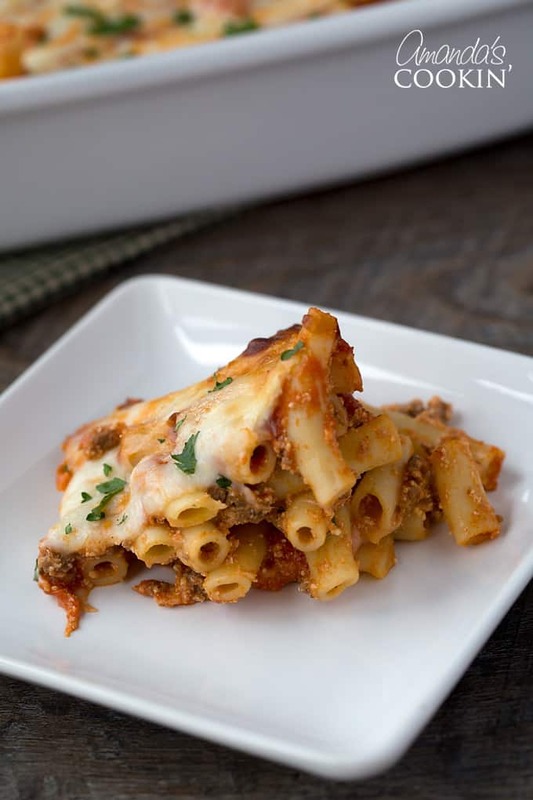 Thanks for sharing this baked ziti recipe! this looks like a crowd pleaser and a perfect weeknight meal! Amanda, that made me want to come by for dinner! YUMMY!! This looks wicked good, backed ziti is the bomb. I'd been tinkering with my recipe, although I haven't made it in a while. I think it's well past time. Heh. 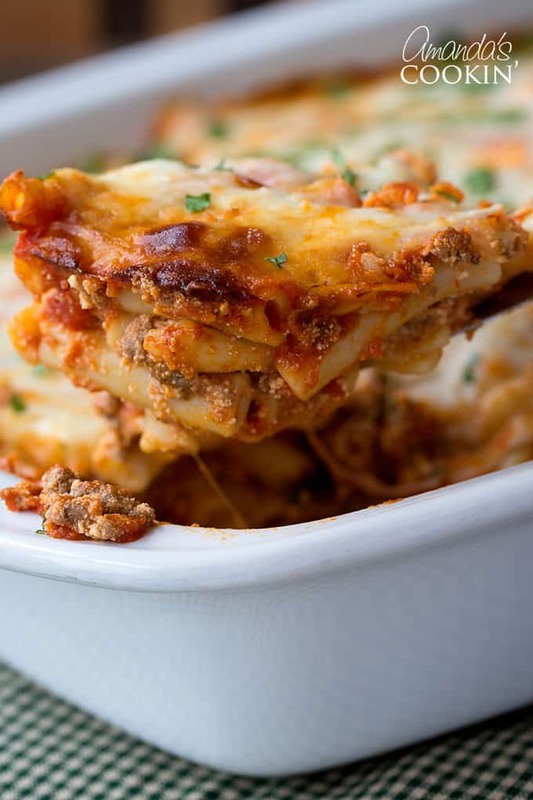 Who doesn't love a great ziti bake? Add a salad and some garlic bread and I'm happy as I can be. Thanks for sharing a great recipe, Amanda. We love anything pasta! I really love the cheesieness of your dish, looks YUM! Now THAT'S cooking!! Fantastic comfort food! Love it!! That looks fantastic! 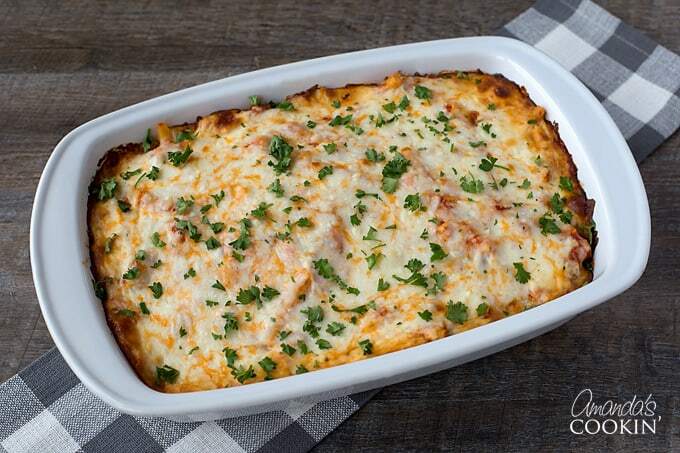 Love me some baked ziti – talk about comfort food. 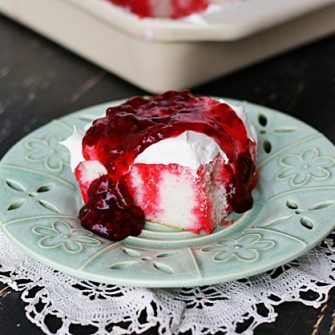 So yummy and super comforting! Look at all that cheesy goodness. YUM! Looks light a might fine photo to me! I would dig right in!